On the Main Line: Shadal series #1 - How was the Tetragrammaton actually pronounced? Shadal series #1 - How was the Tetragrammaton actually pronounced? Once upon a time I planned to have another blog called Shadalian (link) which would be all about the wit and wisdom of Samuel David Luzzatto (Shadal). Since that never happened, I thought that a series of posts with some interesting things about and by Shadal would be a nice idea. I know that given how frequently I already mention him in posts some people might think that I already do this, but this is an attempt at something different. So here begins post #1 in this series. Shadal's comment to Genesis 2:4 is quite interesting, because he tries to determine the correct pronunciation of the Tetragrammaton (YHVH) using internal evidence. Strictly speaking the first part doesn't pertain to the pronunciation, but as an introduction to his view which he gives later it is essential. I'll give an image of the comment as it appears in the Pentateuch published in Padua 1871, followed by my rendering of it, followed by some remarks. Regarding the pronunciation of this name [YHVH] there is no doubt that all through the days of the First Temple and also in the early days of the Second Temple this name was pronounced as it is written, for we see that there are many theoporic names formed from this word (i.e, YHV- or -YHV) during that period. For example, Yehonatan, Yehoyada, Yehoshaphat, Yehoram, Yehoachaz, Achazyahu, Chizkiyahu, Yeshayahu, Yirmiyahu, etc. Also, if they did not read it then why would they write it? It seems that sometime during the Second Temple period the Sages ordained that one should not read it as it is written. Perhaps they did this because they saw that the people were transgressing the Third Commandment, taking God's name in vain. They decreed that the word connoting Lordship should be said instead (i.e., Adonay). We see evidence of this from the Greek translation ascribed to the 70 where the name YHVH is translated in each place as Κύριος. So too in the Latin Vulgate it is translated as Dominus. Similarly in what remains of the work of Origen called the Hexapla we see next to his Greek translation a column of Hebrew words transcribed with Greek letters. In each place where it is written YHWH we see Αδοναι. 2) They pointed the letters וכל"ב appearing before it (i.e., YHVH, meant to be pronounced adonay) with a patach and not a chirik (i.e., vadonay, ladonay, etc. This shows that the first vowel should be Ah-. Showing this is necessary because in truth YHVH is written with a sheva for the first vowel). 3) They pointed a מ at the beginning with a tzéré rather than a chirik (i.e., méadonay, showing, again, that the first vowel should be Ah-). 4) They did not point YHVH in the same way in every place. Sometimes they pointed it with the same vowels used in Elohim; this usage is found before and after the name of Lordship (adonay) is actually written in the text itself, either before or after YHVH (so as not to repeat the word adonay where it isn't written this way in the text, i.e., unlike places where YHVH is repeated twice in the text itself, when it is meant to be pronounced "adonay adonay"). They ordained that in this case YHVH is to be pronounced aloud as Elohim, which is indicated by the vowels. If their intention was otherwise, then they would not have had any reason for changing the pointing. Many have researched how the name is supposed to be pronounced as it is written, namely what are its actual vowels? 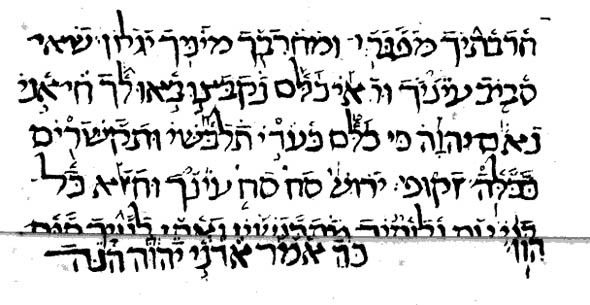 Following what I have written , the consonants as they are written in most places (sheva-cholem-kometz) is actually the authentic vocalization. The reason is because the kometz of /yah/ (which we find at the end of theoporic names) at the start of a word is changed to sheva, such as in Yehonatan and the like. It seems to me that this was the intention of the pointers of the text by pointing the yud with a sheva. For if this was not what they had intended, but simply to point according to the name of Lordship (i.e., the vowels of adonay) then why wouldn't they have voweled the yud with a chataph patach in the same manner that they applied a chataph segol when it was meant to be pronounced /elohim/? Therefore I say that it is true that they wanted to show that it should be read /adonay/ but this pointing managed at the same time to preserve its actual pronunciation, which was known to them through tradition. In other words he is saying that the true, original pronunciation really is Jehovah. We might also add that there is other old evidence for the substitution adonay, as we find in the Yerushalmi Sanhedrin 10 "ר' יעקב בר אחא אמר נכתב ביו"ד ה"א ונקרא באל"ף דל"ת." He couldn't have known this, for even though he saw many old manuscripts he probably never saw a Tiberian manuscript as old as the Aleppo Codex. What he did see must have had the later pointing, with sheva-cholem-kometz and he reasonably assumed that this is how it was always pointed. 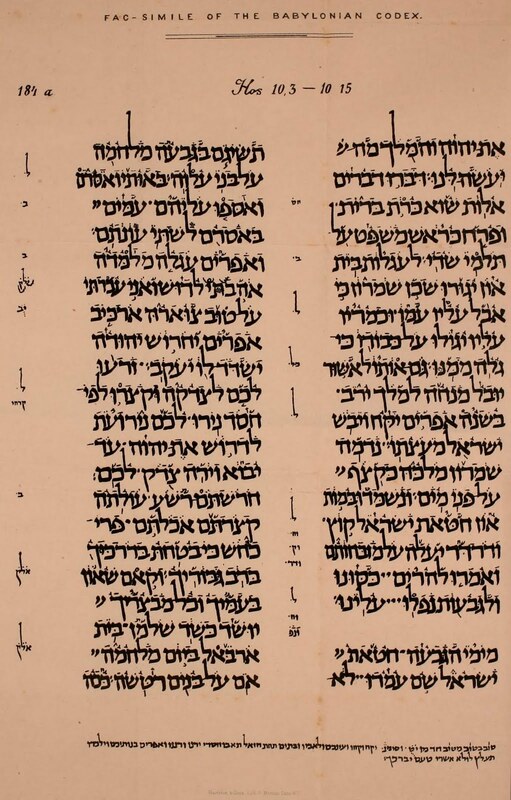 Scholars conjecture that the explanation for thepointing in these early manuscripts is that they were not meant to indicate to pronounce adonay at all, but שמא (shema), which is the Aramaic equivalent of shem (as in Hashem, "the name," in Hebrew). The vowels here certainly work for shema. It should also be noted that the Samaritans say Shema for YHVH and there is early medieval evidence that they did so a long time ago. Shadal's early evidence from the Septuagint, Hexapla, etc. can't be ignored though, so we should bear in mind that adonay is clearly the ancient substitution and not shema. What is being posited then is really a change from adonay to shema and then back again! If this can be explained, that would be nice. The Novernian [sic] pointing is not like ours, and both of them are not like the pointing of Eretz Yisrael." Shadal has two footnotes here. 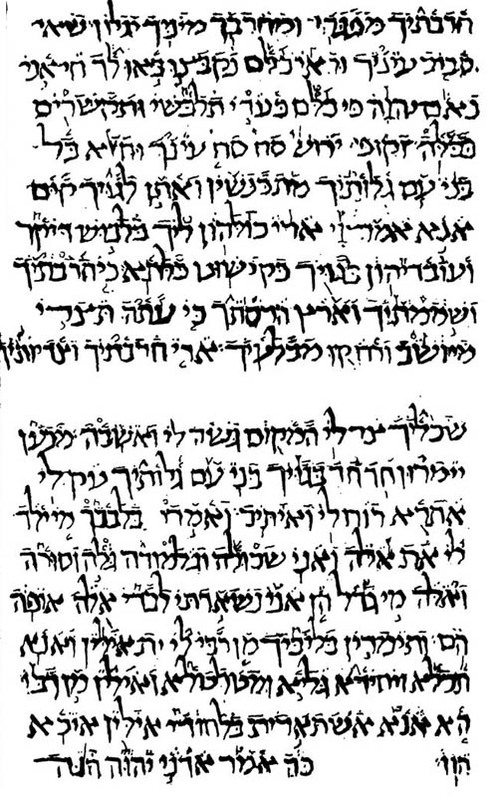 The first emends נוברני ("Novernian," which is meaningless) to טברני ("Tiberian"). Thus the comment, which is speaking of nikkud, states that "The Tiberian pointing is not like [the Babylonian] and both of them are not like the pointing of Eretz Yisrael." 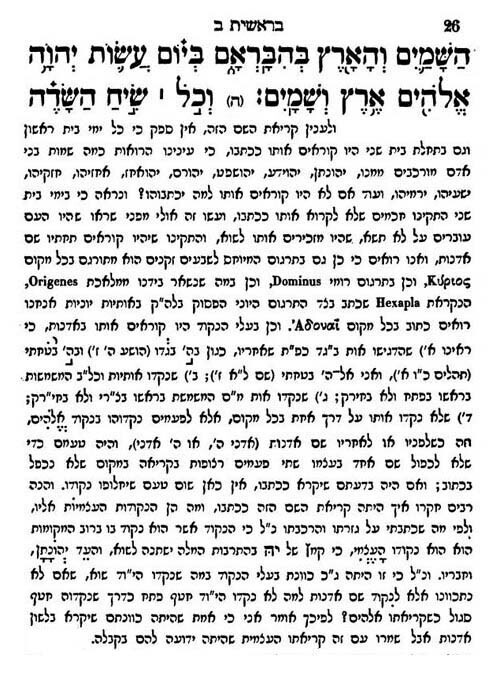 Shadal's second footnote makes the observation that these reported facts are a חדוש גדול, הצריך עיון וחפוש הרבה, or a "very surprising assertion which calls for research and much searching" to explain its meaning of. Today you can find examples of the various kinds of pointings in seconds, yet in 1839 even a man with relatively elite access to rare materials had no idea what a statement like that could have meant. 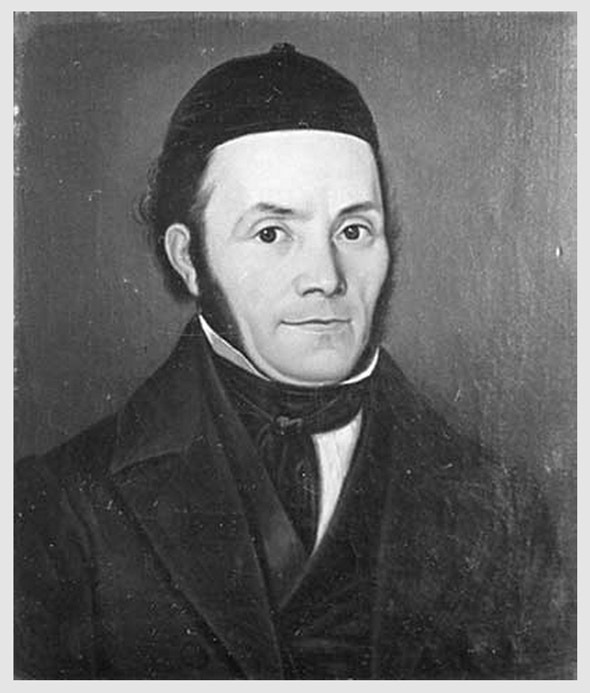 He would not have to wait very long to have the beginnings of an idea, for at precisely that time Karaite scholar Abraham Firkowicz was traveling through Crimea and obtaining old Hebrew manuscripts. Some of them had superlinear pointing. How intriguing this must have been! In fact I remember the first time I learned that there were other pointing systems besides for the Tiberian one we used (who knew it was "Tiberian?") so I can well imagine what seeing something like this must have been like. The one instance of the Tetragrammaton here is preceded by adonay, so it is pointed to read elohim and therefore useless! 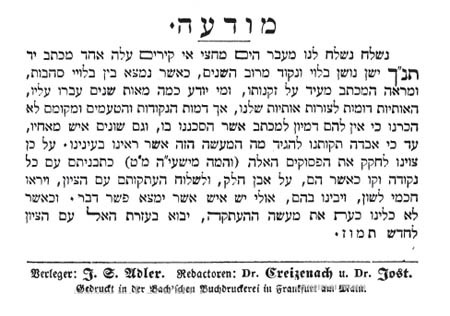 See here, here, here, here and here for more about Pinner and the Chasam Sofer, which is the angle of interest with which most people approach that episode. The point is that whatever limited exposure Shadal had to this pointing in his time would not have proven illuminating. But with the evidence available to him and some careful reasoning he came upon an almost plausible solution. I also think his choice to place this comment on the verse he did - Gen. 2:4 - was very felicitous. "I also think his choice to place this comment on the verse he did - Gen. 2:4 - was very felicitous." It's also the first place the Shem appears, so it could have either been there, or picked arbitrarily, no? >It's also the first place the Shem appears, so it could have either been there, or picked arbitrarily, no? Not necessarily. Another appropriate spot would be in Exodus 3. I see you forgot my theory about needing to pronounce the ayin in שמע so that שמע ישראל wouldn't mean the (pseudozoharic) "God is Israel"
Doh! That's what happens when you aren't careful, and by you of course I mean "I." "What is being posited then is really a change from adonay to shema and then back again! If this can be explained, that would be nice." I don't think that's necessarily the case -- they could have pointed Yhvh with shǝma just to identify it as ha-sheim as we would say today, without intending it to be read that way. And she conceived again, and bore a son: and she said, "Now I will praise YA-hu-WAH: therefore she called his name YA-hu-DHAH." To me, the rhyme scheme is much more revealing. People say that we have lost the pronunciation of the tetragrammaton, but as long as Hebrew has a rhyme shame, and as long as we know the name YA-hu-DHAH, we will always have a way to get to the truth of the matter. The great Mixed Dancing Controversy of 1960-61. R. Jacob Ettlinger as school superintendent. To find next - Yehupitz. 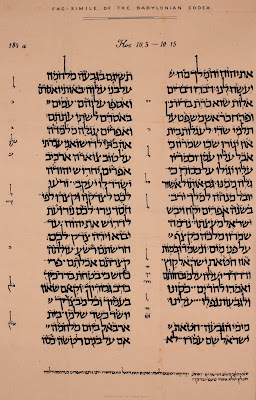 Jerusalem paszkwile now digitized and online. When Israel Abrahams was hissed at.